Today is the first ever Guest Post on the Heirloom blog! I look forward to sharing more resources and advice from other wedding industry professionals! Cory Smith for Four Hats Press is sharing with us her favorite ways to make your paper goods tell your story! Does the location of your event have special significance? Are you getting married under a 100 year-old oak tree? Will you say your vows in the same chapel in which your parents were married? Perhaps depicting an image for sentimental value could express the meaning of place to your guests. Do you love the lyrics from an old Ella Fitzergerald ballad? Are your already busy concocting the perfect dance playlist to incorporate all your favorite love songs through the ages? Borrow phrases from some of your favorite songs as you compile the wording for your invitation or ask guests to request a song for your reception playlist on the reply card. Did you meet your fiancée while on hike in the Blue Ridge Mountains? Do you both have a penchant for bird-watching? Are you hosting your wedding at a seaside inn? Consider incorporating an appropriate pattern or motif into your design. Envelope liners are a great way to add color and pattern to an otherwise classic design. 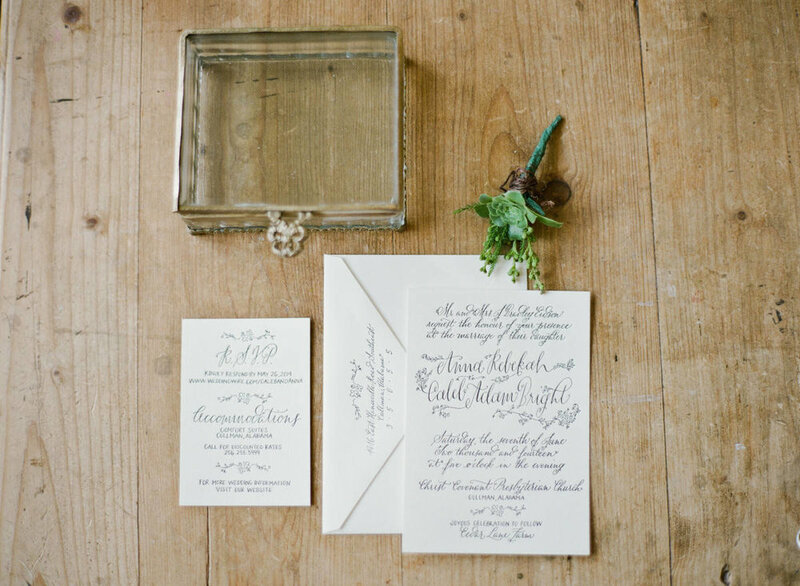 Love the look of a simple hand-written invitation? Have you always loved your grandmother's penmanship or the way your mom writes her thank-you notes? Have someone you love write out the invitation (like below). Such and elegant and sweet way to connect your family to your wedding day. Picking a sweet and specific theme for your postage stamps is another way to add some flair to your suite. Love wildlife? Use collages of bird, butterfly, and flora stamps. Are you big art gallery-goers? Find some old stamps depicting the works of painters and artists. 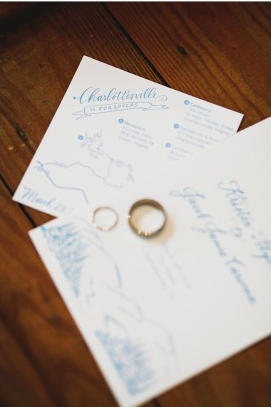 Adding thoughtful details to your paper can be a fun way to set the tone for your event, and give guests insight into who you are as a couple. Cory Smith is a Chicago-based hand-letterer and letterpress printer at Four Hats Press. When she’s not covered in ink, she can be found cozied up next to her fake fireplace or cooking up something delicious in the kitchen.